The other debate that springs from this is on the rôle of technique and technology. Bonnassie argued, on the basis largely of Lynn White’s book, that in the run up to 1000 peasant equipment was getting better: the heavy plough had finally made it to the area, iron tools were more and more common and watermills were newly prevalent.5 Subsequent work, however, has suggested that the heavy plough is basically irrelevant to the average Catalan homestead, where there wasn’t really room to turn it round and the soil is light anyway; that there’s no reason why iron tools should have been more available, since the techniques of smelting don’t change for a few centuries more, so this must actually be effect not cause, the cause being richer peasants; and that watermills are common much earlier, but don’t then seem to have this effect.6 (Also, of course, when most of your documentation comes from a recently-reorganised and expanding frontier zone, almost all infrastructure takes a while to set up, so it’s the wrong place to look for the agricultural state of the art as it will be late; but it’s where most of the documents come from.) The counter-argument, therefore, is that rather than being propelled by innovation or better techniques, the agricultural growth here was a slow buildup of the occupation of newly-cleared land, which was worked in the same way as ever but slowly increased, therefore fed more people who would occupy more land and so on till, boom, exponential growth.7 And if that’s so, then in my opinion the change has to start with the climate, but you’ve read me on that score already. Two of Bonnassie’s contributors engaged with this question in the best way, that is, from the archæology, and produced almost opposite nuances of his approach. Firstly, Jean-Paul Cazes tells the readers about underground grain silos at what appears to be his pet area, the Lauragais in Southern France.8 The thing here is that these perfectly unremarkable dug-out spaces in the ground, which stand out really well as crop-marks, only show up there associated with Roman-period settlement or sites of the ninth century or later. Identifying sites in that gap is of course tricky, tricker than Cazes allows in the small space the contributors seem to have been allowed, but all the same the association is pretty striking, and he argues that it means that the agricultural growth here was local, that is, the peasants were newly able to keep their surplus locally rather than having to render it up to the royal vill or similar as we are told they would have done in the Carolingian era. That is, there may or may not be growth testified in this but there is certainly a relaxation of exploitative authority. It’s a fascinating way of demonstrating what the master who was being fêted had asserted from documents alone. Then, in the immediately following article, Aline Durand tackles the question of how these peasants actually set about working the land.9 In an article that covers a huge amount of ground in a very short space, Durand inventories the tools that later Toulousain documents suggest a peasant was expected to turn up to do his labour service with, and that wills and so forth suggest that they owned, and argues that whereas big estates calling on large labour pools would have ox-teams and heavy ploughs the peasant working his own land would have used an ard or a hoe for most of the work and a hand-plough like the one above, probably not even with wheels, to till his small and light-soiled fields. Durand thinks these tools would have had iron blades, which is where Bonnassie saw the change; Durand’s sources are later so Bonnassie could still be right (and Durand was hardly going to choose this venue to say otherwise). I don’t know where we are with this now: if there is an Owlfish reading, they may be able to add perspective. However, Durand, not content with this short tour de force, observes that while the tools don’t seem to change as some paradigms would argue, field use does: she notes that seigneurial labour levies operate on three ploughings a year, one to break up the sod, one immediately preceding the sowing and another to bury the stubble. This third one, she says, was largely skipped by people working their own land, as far as we can tell; this is after all back-breakingly hard work, especially if you’re doing it as above rather than with an ox-team. However, she suggests that once the model and its superior productivity (because it refreshes the soil) was widely observable people would start to use it on their own lands. 1. Of course, all this progress comes at the cost of anything that might be mistaken for a life, but since that was also the case last semester when I was hanging onto my deadlines by the skin of my teeth, I’m still winning. 2. Classically in Pierre Bonnassie, “Survie et extinction du régime esclavagiste dans l’occident du haut moyen âge (IV-XI s.)” in Cahiers de Civilisation Médiévale Vol. 28 (Poitiers 1985), pp. 307-343, transl. J. Birrell as “The Survival and Extinction of the System of Slavery in the Early Medieval West, fourth to eleventh centuries” in Bonnassie, From Slavery to Feudalism in South-Western Europe, transl. J. Birrell (Cambridge 1991), pp. 1-59. 3. So maintained, for example, in Paul H. Freedman, The Origins of Peasant Servitude in Catalonia, Cambridge Iberian and Latin American Studies (Cambridge 1991). 4. Chris Wickham, “Problems of Comparing Rural Societies in Early Medieval Western Europe” in Transactions of the Royal Historical Society, 6th Series Vol. 2 (Cambridge 1992), pp. 221-246, rev. in idem, Land and Power: studies in Italian and European social history, 400-1200 (London 1994), pp. 201-226. Quote is near the end as I recall. 5. Pierre Bonnassie, La Catalogne du milieu du Xe à la fin du XIe siècle : croissance et mutations d’une société (Toulouse 1975-1976), 2 vols, I pp. 435-475, esp. 459-475, largely on the basis of Lynn T. White, Medieval Technology and Social Change (Oxford 1962). 6. For the plough arguments, not made explicitly for Catalonia but clearly applicable, see Norman Pounds, An Economic History of Medieval Europe, 2nd edn. (London 1994); on iron-smelting I admit my understanding has been recently updated by the comments on this blog-post at Armarium Magnus, which contain references, at least the ones I was interested in did; and on earlier mills you might be best advised to see, if you only could, if I only could, etc., Jonathan Jarrett, Rulers and Ruled in Frontier Catalonia 880-1010: pathways of power (London forthcoming), Chapter probably-3 about Roda de Ter. Also some useful perspectives in C. Arbùcies & J. Oliver, “Vinyes que ja no hi són. Per una arqueològia agrària del domini feudal del treball pagès: les vinyes de Sorre, Montardit (el Pallars Sobirà) i Musser (la Cerdanya)” in Immaculada Ollich i Castanyer (ed. ), Actes del Congrés Internacional Gerbert d’Orlhac i el seu Temps: Catalunya i Europa a la Fi del 1r Mil·lenni, Vic-Ripoll, 10-13 de Novembre de 1999 (Vic 1999), pp. 321-337. 7. For a range of views on this issue, and others, mainly focussing on whether or not Robert Fossier was wrong about it, try Georges Duby (coord. ), “Table Ronde” in La Croissance Agricole du Haut Moyen Âge : chronologie, modalités, géographie. Dixième Journées Internationales d’Histoire, 9, 10, 11, Septembre 1988, Flaran Vol. 10 (Auch 1990), pp. 181-203. Fossier argues that he wasn’t, as you’d expect. Contrast Bonnassie’s contribution to the volume, “La croissance agricole du haut moyen âge dans la Gaule du Midi et le nord-est de la péninsule ibérique : chronologie, modalités, limites”, ibid. pp. 13-35. 8. J.-P. Cazes, “Les silos et leur significance dans le haut moyen âge. L’exemple du Lauragais” in Hélène Débax (ed. ), Les sociétés méridionales à l’âge féodal (l’Espagne, Italie et sud de France Xe-XIIIe s.). Hommage à Pierre Bonnassie, Méridiennes 8 (Toulouse 1999), pp. 45-50. 9. A. Durand, “La labour de céréaliculture en Languedoc méditerranéen (Xe-XIIe siècles) : quelques points de repères”, ibid. pp. 51-56. 10. For example, see his reply to Dominique Barthélemy in Bonnassie, “Nouveautés linguistiques et mutations économico-sociales dans la Catalogne des IXe-XIe siècles” in Michel Banniard (ed. ), Langages et Peuples d’Europe : cristallisation des identités romanes et germanique. Colloque International organisé par le Centre d’Art et Civilisation Médiévale de Conques et l’Université de Toulouse-le-Mirail (Toulouse-Conques, juillet 1997), Méridiennes 5 (Toulouse 2002), pp. 47-66. 11. Referring to Gaspar Feliu, “La pagesia catalana abans de la feudalització” in Anuario de Estudios Medievales Vol. 26 (Barcelona 1994), pp. 19-41, partly addressed by another of the Festschrift contributors, Pere Benito i Monclús, in his “El plet dels homes francs de Sarrià (1258). Crisi i pervivència de l’alou pagès a la Catalunya medieval” in Débax, Sociétés Méridionales, pp. 71-79. This is more the remit of Aardvarchaeology and Bad Archaeology, the latter of whom have indeed already picked it up, but Ben Goldacre of Bad Science has struck a blow for archæology being a science by covering a new piece of pseudo-archæology in his blog. Do you remember ages back I reported on a Leeds paper that rested on some fairly challengeable observation about proximity of certain sorts of sites to each other, after which someone had said to me, “yes, great, now they should plot them against telephone boxes and see if that pattern doesn’t look just as significant”? Well, this is the same reaction but taken far further. Hurrah for Matt Parker and hurrah for Ben Goldacre for reporting him. So yes, it’s all very well for me to say how pernicious ancient textbooks in new editions are; and very interesting to hear others providing a counter-example in the form of Judith Bennett’s revision of Warren Hollister’s old one. But, seeing the deficiency from a way off I wondered what else was out there, and grabbed myself an evaluation copy of this, Medieval Worlds: a introduction to European history 300-1492 by Jo Ann Hoeppner Moran Cruz and Richard Gerberding, very largely because of how much I enjoyed Richard Gerberding’s other work I recently met and wondering how that would lend itself to teaching students to read sources. And it’s good, I think, though not necessarily what I might have expected. The European Middle Ages themselves are, of course, fixed in the past, but their study continues to evolve. Not only do today’s scholars continually discover new things about the Middle Ages, but they also, in reflecting on the problems and attitudes of our own times, pose new problems and ask new questions. This book was written both to include the best research in traditional medieval topics and to explore those elements of medieval society that reflect the changed interests of our times. For instance, as Europeans and Americans now wrestle with ideas of what makes a person American or European, so too have recent scholars explored the medieval origins of ethnic identity, asking what made a man or a woman a Roman, a Visigoth, a Briton, a Spaniard, or a Pole. Recent scholarship is greatly concerned with cultural and social history, exploring medieval marriage, children, families, and demographic history. These inquiries have produced a picture of the Middle Ages that is much more complex and much more exciting than once thought. We find that medieval societies varied greatly by time and place, and that medieval Europe was not its own closed world but quite open to outside influences. This book presents this richer, deeper, and broader view of medieval life. You will find women presented as an integral part of medieval society rather than as a fascinating afterthought. You will find that the geographical boundaries of medieval Europe presented here reflect the integral part played by societies once thought to have been outsiders. For instance, the treatment of the tenth century moves beyond the traditional focus on the disintegrating Carolingian Empire to show the vital new societies emerging in Scandinavia, Germany, eastern Europe and Rusland, the Balkans, Italy, and Spain. We cover much political history, but this is politics conceived in light of recent scholarship, that is, not as battles, dates, or deeds of kings and popes, but as the way societies in various times and places organised themselves for concerted organisation. History is, at its base, the study of change set in time, and we expect that the chronological organisation of this text will give you the structure you will need should you decide to explore various topics in medieval history more fully later. 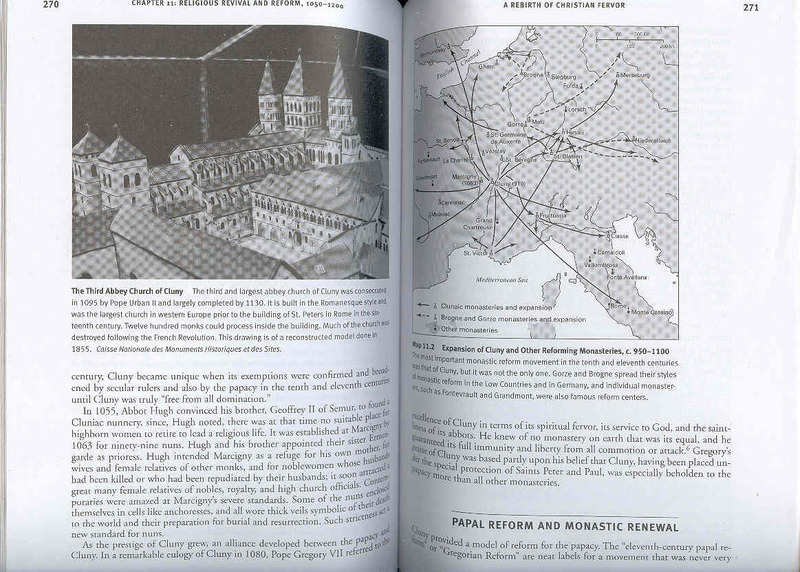 To help you see how a clear understanding of medieval history anchors itself firmly in time we have included timelines and chronological lists of rulers at the back of the book. To help you understand medieval people themselves, we have included special features in each chapter where the people of each period speak for themselves (Medieval Voices) or where we describe a contemporary individual in some detail (Medieval Portraits). I’ve quoted at such length here (this is pp. xv-xvi) partly because I’d have had to say a lot of the description of the arrangement and contents in my own words otherwise, and there were some perfectly good ones here, but mainly because it’s a clear description of what they think needs teaching and how they think it should be done. So the question is how far do they deliver, and I think the fair answer is ‘most of the way’. 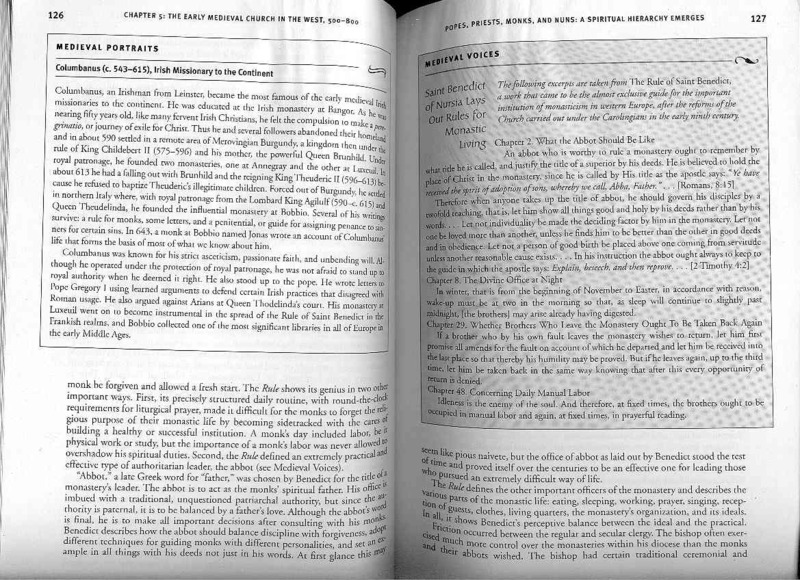 The Medieval Portraits, by and large, I think, contribute little, except in as much as individuals are otherwise fairly sparse in the narrative and maybe without them the whole thing would become impersonal; this trick, done as text boxes once or twice a chapter, certainly stops that even if it rarely relates as directly to the text as the anchors therein seem to suggest. I would still have cheerfully given all these spaces up to the other such ‘extra’, Medieval Voices, which is where Gerberding’s particular skills could perhaps have borne more fruit. They are more or less played straight, however, a short illustration from a key source, often long enough to distract but not enough to explain their own importance. I guess it’s hard to choose these things but I had imagined more of a compromise towards sourcebook than they actually attempt. On the other hand, what they do cover is immense. They start with general concepts like ‘Time’ and ‘Space’, framing a world-view (pp. 3-7, 11-13). Then, despite claiming 300-1492 as a timespan, they actually start by setting up Rome as a Republic and then Empire in at least as much detail as anything else gets in their somewhat sweeping range (pp. 18-26). On the other hand, only in Spain does the text really get as far as 1492, everywhere else shading off into a fairly indistinct late medieval era after about 1380. Political narrative is always very thin, so distinguishing one half-century from another becomes problematic at this end; with the Hundred Years War, the beginnings of the Renaissance, universities and voyages of discovery and colonisation (the Portuguese down the African coast) already in progress by book end, it is therefore hard to distinguish 1400 from 1500 in their terms perhaps, though I’m not sure this is really fair on the period. Other than that, however, it’s hard to say there’s a definite bias of coverage. Byzantium does rather sit on its own rather than joining in the fun, even when Eastern Europe is in play where its tendrils should be ever-present, but it gets a lot of space all the same. Eastern Europe gets rather more attention, even, and Islam is adequately treated, at least by my lights. Furthermore the authors certainly deliver on gender balance; women represent a good proportion of the Medieval Portraits and are frequently discussed in the main text, perhaps not every chapter but often and with attention. Likewise, the authors absolutely deliver on their social history agenda. As with Julia Smith’s Europe after Rome it is deemed almost impossible to produce an adequate political account in the space available (which is more than it seems: the book is on very thin paper, and unexpectedly heavy until you find that it runs to 612 pages without being much wider than any normal octavo academic monograph), but the result is not a softening of the narrative, but a very clear and hard-nosed account of social phenomena. Also as with Julia Smith’s book, this has mainly been achieved by an exquisite care over inclusion; an awful lot is omitted here that I could never have borne to exclude, but that, if it had stayed in the book, would have made it twice the size. Although I wonder, since the criteria of inclusion are so much tied to the Zeitgeist of medieval studies as they currently perceive it, whether this book will age well, right now it seems fairly right-on to me. Some attempt to compensate for this lack of names and dates is of course provided at the back, in the form of the ruler-lists and chronology (pp. 537-562; pp. 563-584 are a thorough and up-to-date per-chapter bibliography and pp. 585-612 a comprehensive index, further recommendations). The chronology, which is separated into three columns for political, religious and cultural phenomena, is interesting as an exercise but could, in this compressed format, have included much more. As it is, it functions mainly as a look-up table to position events mentioned in the main text, which may I suppose be a valid way to do it but compares badly to the ruler lists because they are fabulously comprehensive. I would have wished dearly, had I been able to influence the authors, to see the Fatimid Caliphs added too, whereas we only get the Umayyad and ‘Abbasid ones, and perhaps also the Mongol Khans; there are enough free half-pages that they could have been accommodated. Otherwise though, everyone’s here, and one of the things that will make me glad to have this is having somewhere more accessible than the otherwise tempting Wikipedia to check regnal dates that I’ve forgotten like an idiot. That said, typoes and mistakes, which elsewhere plague the book in the manner of mild and intermittent acne only, here stand out like ugly blackheads and suggest poor proof-reading. It may not have been obvious, for example, that Charles the Fat had been given the same date ranges for both pre-imperial and imperial rules, but it should have been immediately apparent that Louis IV of France had somehow been given the regnal dates that belonged to Philip IV, repeated in their proper place on the facing page. This is a pity, as these tables and lists are where accuracy of data matters most in a book otherwise so sparing with numbers and names. On the other hand, a final word of praise ought to be reserved for the maps. The illustrations, though frequent, fail rather to inspire because of the low-grade greyscale standard of reproduction. It’s difficult to get excited about something so riotously colourful as a Franco-Saxon illuminated manuscript or the Mosque of Córdoba when they’re thus levelled downwards. But the maps are just as frequent, and also sharp, clear and helpful. My personal taste would have been to have more extraneous data on them, because for me the joy of maps is often not the things one is being directed to, whose vague location and relation one probably already knew, but the things you’d never realised were near them, or far from them, or on completely different river that links it to somewhere else you know about. (It is of course very easy to make false associations like this when you haven’t mapped so much that it becomes impossible to read except with a computer, so I may not be helping myself by indulging this mania.) As with the text, the authors and their cartographers (who were not always producing for this volume, but whose works have been chosen very carefully from others where not so, so that you wouldn’t know without reading the credits) have resisted this temptation, and as a result the maps rapidly convey what they’re supposed to and probably support the text better than most of the other intrusions with which the authors disturb it. So in summary, I think this book is a fashionable one, and so may date badly, but it represents a fashion in which I definitely feel bred, of telling social history as hard not soft, and bringing out the explanatory value of social developments rather than the effects of Great Men and other tenets of Old History. I think it will serve a student who uses it well, as long as (unfortunately) they don’t rely on the ruler lists and chronology too much, and that most people could read it and be well-informed, though they might not want to pay £37 for a paperback even if it does have 600 very thin pages. It has its problems, typoes and the odd piece of unreconstructed schoolbook history, as we’ve noted already, and its illustrations are lacklustre and some of its extras rather too extraneous, but with those reservations expressed and quickly left behind, the upsides are clarity, determined adherence to agendas of balance and inclusion that are straightforward and easy to endorse, and a range and spread not available in many other textbooks I’ve met. So I have no problems recommending this one. Despite earlier resolves, I may have to give into negativity just briefly here. My forecast of intermittent displeasure at reading Michel Zimmermann’s huge and engrossing work Écrire et lire en Catalogne continues to be accurate. In Chapter II, he speaks at length about signatures, what they show about people’s wish to be present in a document, the shame of not being able to write and so on. It’s fascinating, honestly. And he notes the idea that, when they couldn’t write, the witnesses to a charter of my period, or his, tenth to twelfth centuries in what is now Catalonia, would instead mark points in the angles of a cross made by the scribe, so that at least they would have ‘made their mark’. He quotes texts that use the verb ‘punctire’ for this practice, but with uncharacteristic omission doesn’t give a reference. This, to me, is maddening. But when he does give a reference, it’s not necessarily any less so. He says that on some charters it is plainly visible that this has happened, and cites two. Now, since he wrote, both have been printed, so I hooked the editions off the shelf in the Institute of Historical Research and looked to see if the editors had noted this. And I found that in the first case it is definite, because the actual document records as much, and in the second case probable, in as much as the editors suspect it (because, significantly for either their case or Zimmermann’s or both, there are no autograph signatures) that the documents are not originals, but later copies. So they can hardly bear any evidence of the signing practices of the original witnesses, can they? At this point I think one is entitled to ask “what the heck?” and wonder how much else of what he says can be relied on, however brilliant it may read. I suspect that the answer is that, when you’re writing up a project that ran over more than a decade and over which any attempt at digital record would likely have obsolesced (I know mine has), notes get jumbled and references garbled. I am sure that there do exist documents that Prof. Zimmermann saw that left this impression on him. But I hope it wasn’t these ones, and either way it remains for someone else to discover some more. The book in question is, cited in full, M. Zimmermann, Écrire et lire en Catalogne (IXe-XIIe siècle), Bibliothèque de la Casa de Velázquez 23 (Madrid 2003), 2 vols, and here I refer to I pp. 83-91. The documents that he cites (on I p. 85) are Arxiu Capitular de Vic, calaix 9, episcoporum II no. 36, a notarial transcription from 1039 of a document of 1032, now edited as Ramon Ordeig i Mata (ed. ), Diplomatari de la Catedral de Vic (segle XI) (Vic 2003-), 2 fascs so far, doc. no. 906, and Arxiu Capitular de Barcelona, Diversorum B no. 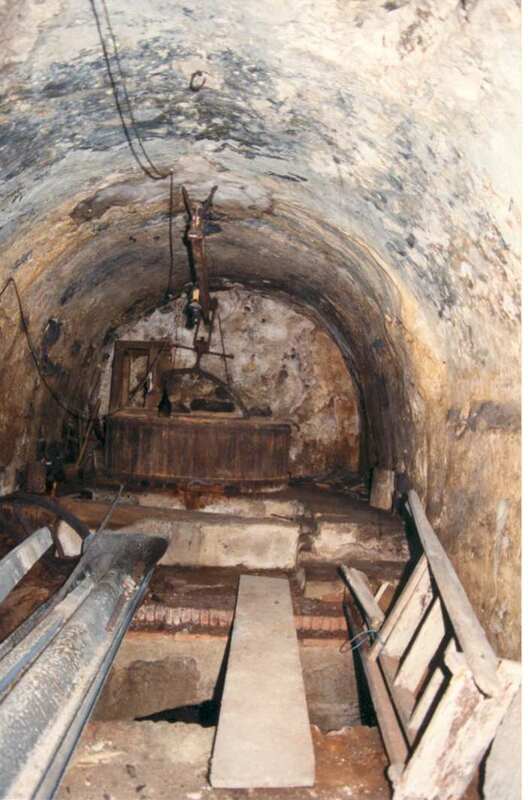 23, now edited as J. Baucells i Reig et al. (edd. ), Diplomatari de l’Arxiu Capitular de la Catedral de Barcelona: segle XI (Barcelona 2006), 5 vols, doc. no. 362, or at least this is the only document of the right date in that edition though the shelfmark does not seem to be the same as the one Zimmermann gives. Then, argues Dodds, there come the Carolingians and a centralising authority with its own ideological project, and since art follows patronage and patronage requires wealth, which tends to come from power, that ideology bends art towards its chosen ideal. Adopting Carolingian styles, or the particular form of imitation of Rome and late antique culture that the Carolingians like to present, is a way of stressing one’s membership of this unity, but as that membership becomes less desirable and the élites of the regions lose interest in the centralising power, the force of local identity is let loose on this style, meaning a new diversification of Carolingian art and building styles in the various places they no longer control, although before long one of these variations becomes a new hegemony under the Ottonians. I find this a very powerful explanatory paradigm, and as I said when I first mentioned this article it serves to remind one, very convincingly, that art really can reflect power strategies, especially in this era when wealth is so concentrated and art so expensive. That said, I feel discomfort with the tightness of the envelope and I’d like to think some of this stuff out more. I know, for example, that there is a school of anthropological thought that argues that borders are very often sites of cultural production, and that what the border originates the centre will often follow. (The name I have been told is Gloria Anzáldua and her book Borderlands but I have yet to take my anthropologist-of-resort’s exhortations to actually read it far enough to heart, alas.) Quite where that leaves the idea of centralising artistic projects I’m not sure, and I wonder if Dodds and Anzáldua’s paradigms could actually be brought into dialogue here. Rome, I presume, is what bends things here; all these projects are some variation on Rome in Dodds’s view. Secondly, there is the problem that Romanesque really does spread. It’s rare in England I believe, where ‘Norman’ as a style is affected by it but not quite the same thing. But compare the below, which are from many many hundreds of miles apart, one from inside the Ottonian domains (though later) and the other from outside even the Carolingian ones. I could find more, and they would stress, yes, diversity, but not enough diversity that you would necessarily be able to say, without knowing that the tower of Sankt Hippolyt there has a peaked wooden roof and the tower of Sant Andreu de Gurb up above has a spire, which of the two was from where. And although Santo Toribio’s tower is hardly there you can see from the fabric and the windows that the building is basically part of the same project, and indeed if you go out to Catalonia and wander you will find that people were still building in this basic style for the next eight hundred years, give or take, and that guessing whether something is medieval or not comes down basically to weathering or finding the tourist information plaque. Can this really all be explained by power relations and the universal church? And if not, what on earth does explain it? Dodds’s answer is the best I have seen, but clashes with some of what we know of medieval political identity and rivalry. Or does it? It may be, instead, that I am just a bit too soaked in my region and my medieval world-view is too shrunk to accommodate something this big. Or, it may be that the élite culture is in the end mostly useful for talking about the élite and that stepping into such a building would not have made the average worshipper feel connected, or Roman, or Catholic, but just apprehensive and God-fearing. That is, I wonder if the primary purpose of this art really is political, even if it may still reflect political choices. As you can see, Professor Dodds has given me plenty to think about, but I’m not finished yet. That article, again, is J. Dodds, “Entre Roma y el Románico: el mito de Occidente” in Jordi Camps (ed. ), Cataluña en la época carolingia: Arte y cultura antes del románico (siglos IX y X) (Barcelona 1999), pp. 147-155, transl. as “Between Rome and Romanesque: the myth of the west”, ibid. pp. 492-496. For the story of Pietro Orseolo, however, I’d need to go back to Ramon d’Abadal i de Vinyals, L’Abat Oliba, Bisbe de Vic, i la seva època (Barcelona 1948; 2nd edn. 1948; 3rd edn. 1962), 3rd edn. repr. as “L’Abat Oliba i la seva època” in idem, Dels Visigots als Catalans, ed. J. Sobrequés i Callicó, Estudis i documents XIII-XIV (Barcelona 1969, repr. 1974 & 1989), 2 vols, II pp. 141-277, though I’m sure it must be covered elsewhere too. I am a pessimist, unless I try very hard. Mostly I assume that my pessimism is just realism but every now and then I am reminded, usually by frustrated loved ones, that I am not in the habit of seeing the good side of things. Recently I was reminded of this by my spontaneous reaction to a post of Dr Virago’s at Quod She that ended with the question, “So what were your most gratifying moments of 2009?” To which, before I even thought about it, my reaction was “huh, well there weren’t any really were there?” Which can’t be true, not even semantically. So I thought it was probably worth a struggle to recall them. An obvious one: receiving the book contract in the post. Not signing it, so much, just having it, and therefore the option to sign, or not if I didn’t want, was a source of gratification for some time, and probably delayed my actual signing and sending it back. It was of course hard immediately to recall that because it’s been about four months since I heard anything about the book and I now don’t think it can come out by Leeds, but nonetheless, that moment was there. Being asked to teach at Queen Mary, after a while of teaching drought, was also a good one. Subsequently I found out that I’d been recommended to them at third hand (and I still owe people beers for that, sorry) but being able to ask what the course was and then say, “yes, I can do that” was a shot in the arm; apparently I could be a paid medievalist after all! Similarly, being asked, able and willing to participate in the conference for Rosamond McKitterick, a chance to say thanks for a great many favours and to remind my peers (and indeed supervisor) I was still scholarly active. I enjoyed the whole thing and the idea that it was probably helping me and that it meant a sort of recognition was part of that. Of course, teaching, though I didn’t enjoy it very much this year it must be said, paid back a bit during essay tutorials and seeing close-up who has really clicked with the stuff, and also people coming good against the odds; this is always heartening, though I am used to getting more of it than I have this semester just gone. Working on that. But the enthusiasm of the interested, or the moment of revelation when you give them the detail that makes it all click into place, that’s still good and I hope always will be. Had a few of those. And also, I’ve met some good people this year and been to some good places, caught up with almost all my old contacts and drunk many a drink with the learned and never had cause not to feel like one of them. It’s just that I was hoping at least to publish something in 2009, any of the four papers I’d made final revisions on in 2008 for example, the book, anything (though there was of course this booklet, which still doesn’t really feel like me). I was hoping to be able to stop promising future achievements to my referees and report some present ones. I was hoping to get to Catalonia again and sort some stuff out, but I only managed the former. I was hoping one of the projects I was on at work would produce something people could see inside the year, but they haven’t. And I was probably hoping somewhere to get one of the jobs I’d applied for, and that hasn’t (yet) worked either. My pessimism, you see, works on this basis: if it doesn’t lead anywhere, it wasn’t really that great. I need to work on that: some of this stuff was fairly great in and of itself.